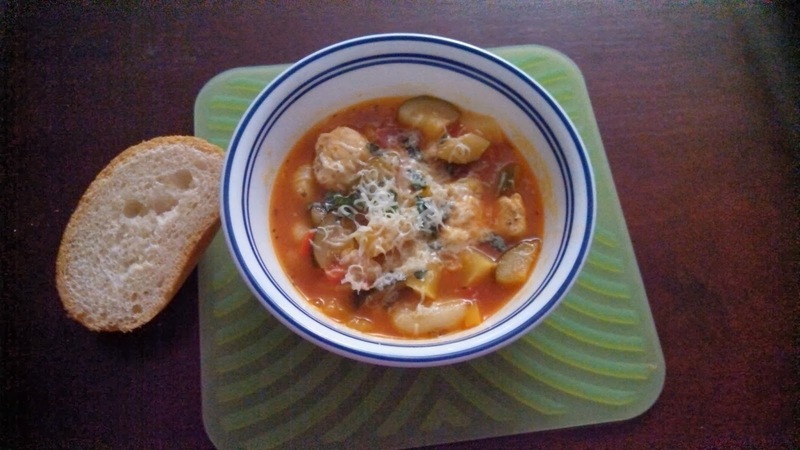 We braved the closing Dominick's store last week and ended up getting some gnocchi. Neither Kevin or myself had cooked with it before so I went to Pinterest in an effort to find a good recipe to use it with. Surprisingly Kevin chose a soup recipe! Seriously I try to get this kid to eat soup all the time and he has none of it. 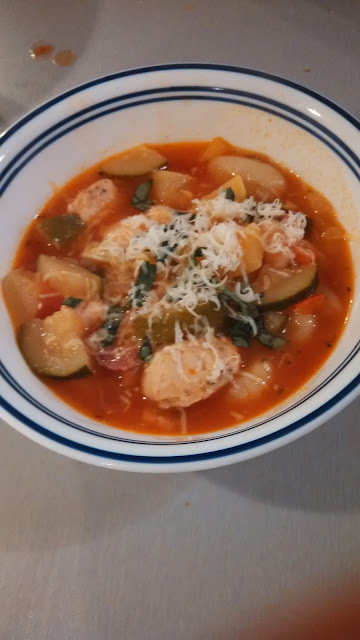 I adapted this Gnocchi Chicken Minestrone soup from Taste of Home. 1. Chop all of the veggies and set aside in bowl. Combine broth, tomatoes, beans, peas, tomato paste Classic Batter Bowl and set aside. By doing this before it makes it much easier during cooking!! It looks terrible but seriously it helps!! 2. Sprinkle chicken with oregano, salt and pepper. 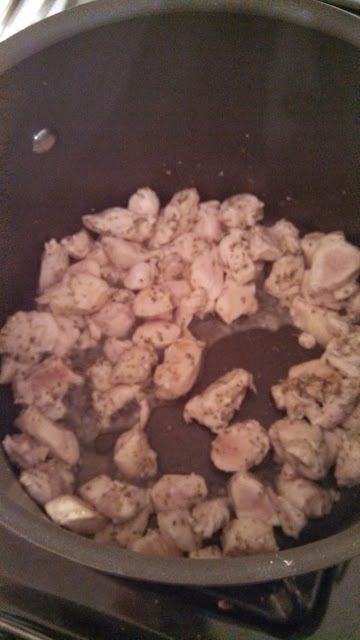 In a Dutch oven, saute chicken in 1 tablespoon oil until no longer pink. Remove and set aside. 3. 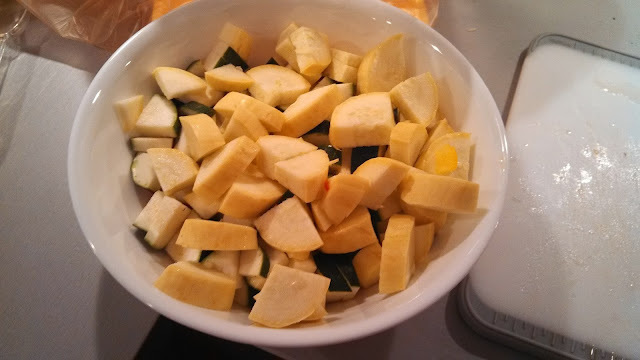 In the same pan, cook the peppers, zucchini, squash and onion in remaining oil until tender. 4. Add prosciutto and garlic; cook 1 minute longer. 5. 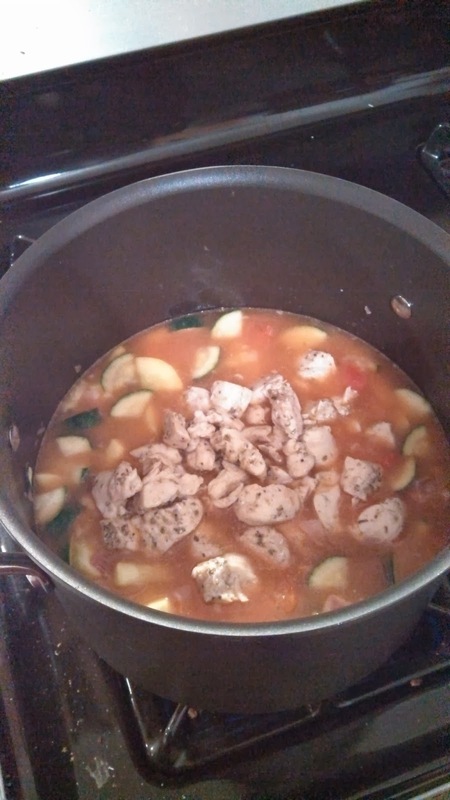 Add the broth, tomatoes, beans, peas, tomato paste and chicken. Bring to a boil. 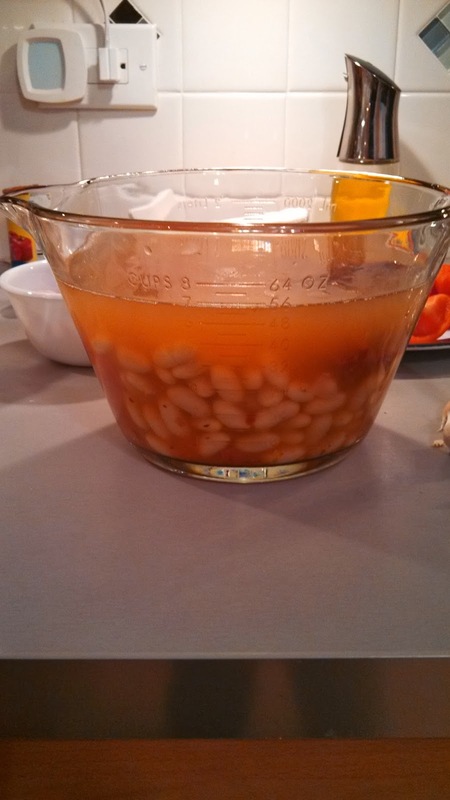 Reduce heat to simmer, uncovered for 20 minutes, stirring occasionally. 6. While soup is heating cook gnocchi according to package directions. Drain; stir into soup. Garnish each serving with cheese and basil. I think I could have done without the fresh basil on top I couldn't really taste it. Overall this recipe was pretty good. Kevin really enjoyed it again today for lunch. I think I was a little disappointed it didn't taste like the minestrone from the restaurant we like so much but the broth was almost a dead ringer for it so maybe I need to change up the veggies some more! This looks and sounds really good, have to give this a try!